It’s grills gone wild at Barbecue University, the intense hands-on workshop I teach every year at the Broadmoor resort in Colorado. Our students often get weak-kneed when surveying our scorching collection of more three dozen grills and smokers for the first time. Hell, even I get excited when I see the new collection of grills and smokers reunited on the impossibly scenic terrace that serves as our outdoor classroom/burn area. (And I’ve been running BBQ U for 15 years!) This must be what Jay Leno feels like when he’s alone with his cars. Or Hugh Hefner with his … never mind. Our collection has evolved over the years. Now more than ever, it reflects the surging popularity of smoking, as well as growing interest in global grilling. In 2014, our students will have the opportunity to cook on an international assortment of grills, including a Japanese donabe smoker, Brazilian rotisserie, and a German Schwenker, a “swinging grill.” Closer to home, we’re also hauling in a professional Lang competition-style smoker. See? Told-ja things were heating up. The grills of Barbecue University run the gamut from primitive to high-tech, from modest hibachis to imposing stainless steel supergrills that cost as much as a car—and everything in-between. Fire Magic Echelon Diamond Series 1060: Install this shiny colossus on the patio of your manse, and there’ll be no doubt you’ve arrived. 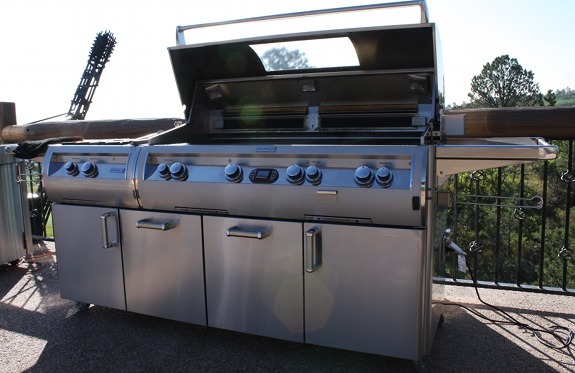 The flagship grill of the RH Peterson Company in City of Industry, California, this Echelon boasts 1000 square inches of cooking space, a futuristic viewing window, interior lighting, a powerful side burner, infrared back burners, and a rotisserie that can handle a junior hog. Yeah, even the hood has a push button smooth-as-silk lift. 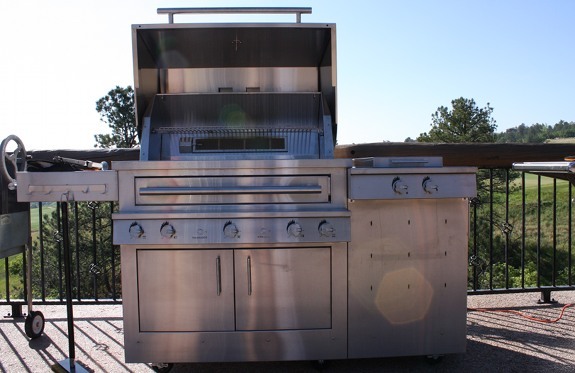 It’s one of the most expensive grills at BBQ U. Retails for around $16,000. Pit Barrel Cooker: It’s amazing what you can do with a 30-gallon drum. Just ask Noah Glanville, an enterprising Iraq war vet whose mission, once home in Strasburg, Colorado, was to create an affordable, easy-to-use vertical pit-style smoker. This deceptively simple grill/smoker comes with a grill grate, charcoal basket, 2 steel rods and 8 hooks for hanging multiple racks of ribs, sausages, etc. It’s a perfect size for smaller outdoor spaces. And at $260, it won’t break the bank. Kalamazoo K750HS: Live-fire cooking fanatics are drawn to this high testosterone grill like proverbial moth to flame. 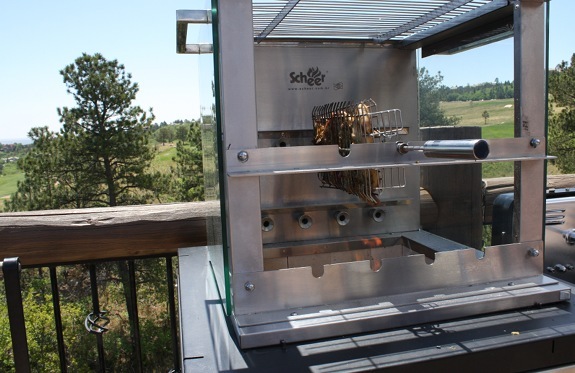 It settles the whole gas versus charcoal versus wood debate ingeniously and decisively, because you can grill with all three thanks to the unique Hybrid Fire Grilling System. Simply pull out the fuel drawer and load it with charcoal or logs. The industrial strength 75,000 BTU burners do the rest. The chain-driven rotisserie spit handles a 7-bone prime rib like it’s a game hen. Each of the three brass burners weighs 14 pounds. Side burner? Check. Massive laser cut grill grate? Check. And as a testament to quality, the inside door panel was signed by the Kalamazoo craftsmen and women who built it. A hot grill for a cool $17,000. Epicoa/Scheer Vaquero: If you’ve ever eaten at a Brazilian steakhouse such as Fogo de Chão, where gaucho-garbed waiters parade skewers of roasted meats through the dining room, you’re an enthusiast of churrasco. An epic meal to be sure, but not one you could experience at home. Until recently, that is, with the advent of the Vaquero, a monumentally impressive restaurant-quality Brazilian rotisserie designed for outdoor home kitchens. Seven skewers, optional grilling baskets, and warming racks make this the penultimate device for serial grillers. Can accommodate up to 80 pounds of food. Call 1-888-280-2028 for pricing and details. You can also learn more about the Epicoa Scheer collection here. Really Big Big Green Egg: Go big or go home, as they say. So we upgraded to the monster size Big Green Egg XL in June. The thick ceramic walls of this charcoal-burning kamado-style cooker concentrate and retain heat, enabling interior temperatures that exceed 600 degrees. But the real genius of the Egg lies in its venting system—a stainless steel vent at the bottom and a chimney-like vent at the top, which enables you to go from 200 degrees for low and slow smoking to a screaming hot fire for grilling. Thus you can use it for grilling, indirect grilling, and smoking. The BGE is highly efficient: A single load of fuel can burn for hours. 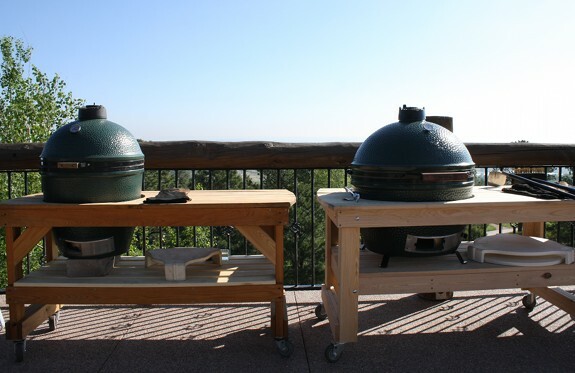 The largest Egg in the BGE line, the XL features 452 inches of cooking space and can accommodate two turkeys. The cost? About $1100 not including the worktable. For a dealer locater, go to www.biggreenegg.com. 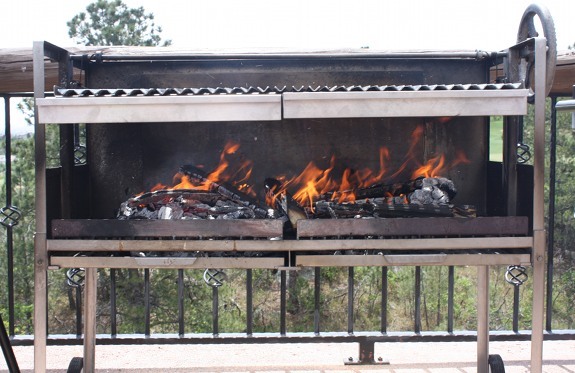 Grillworks/The Grillery: This is it—the wood-burning grill that generates more fan mail than any other grill featured on my Barbecue University™ and Primal Grill shows on PBS. Designed by former Time magazine correspondent Charles Eisendrath and today manufactured by his son, Ben, the Grillery combines the wood-burning machismo of Argentina’s gauchos (cowboys) with a high design worthy of Architectural Digest. You want features? How about an aluminum flywheel to raise and lower the grill grate for heat control, and V-shaped bars on the grill grate to funnel the flammable fat away from the fire? Custom-built professional versions of Grillworks’ products can be seen in action at grill-obsessed restaurants like Portland’s OX and Blue Hill at Stone Barns in Pocantico Hills, New York. But don’t take our word for it. 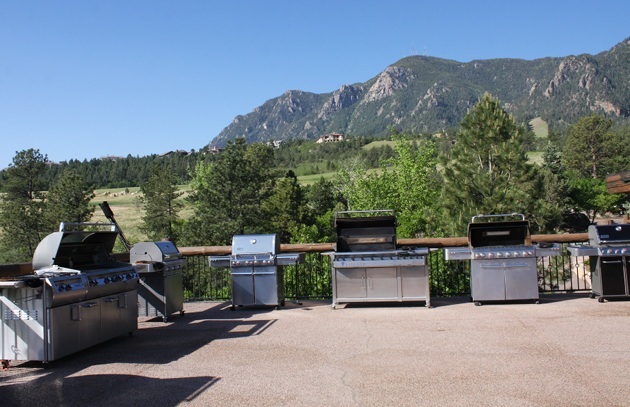 Come test-drive these grills and two dozen more at the next session of Barbecue University, May 28 – May 31 and May 31 – June 3, 2014.